Voeu is luxury skin care of every women. 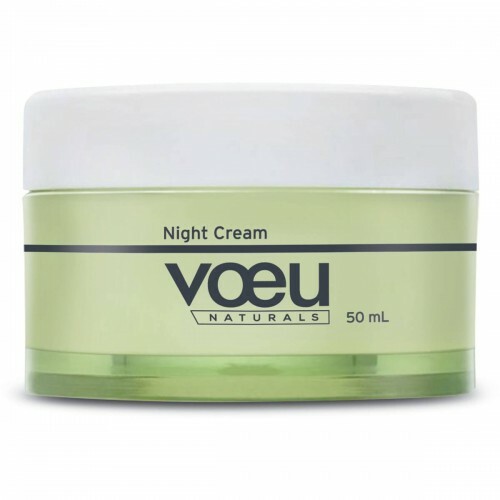 The Voeu Naturals range is enriched with Kakadu Plum, essentials oil and Vitamin E & A.
Voeu Naturals Night Cream is an intense overnight restoration that works throughout the night so you'll wake up feeling energised and refreshed. - Over 90% Naturally Derived Ingredients. - Free from paraben, sulphates, synthetic fragrances, animal derivatives, harsh detergents, propylene glycol, artificial colours, trienthanolamine and mineral oil. Kakadu Plum has about 100 times Vitamin C than that of oranges and 4 times the antioxidants of blueberries. Kakadu plum oil has antibacterial, anti-viral and anti-inflammatory properties. An intense overnight restoration with Vitamin A (normalises skin function) & E (skin healing), essential oils, aloe vera and shea butter. Love Voeu Naturals Night Cream?